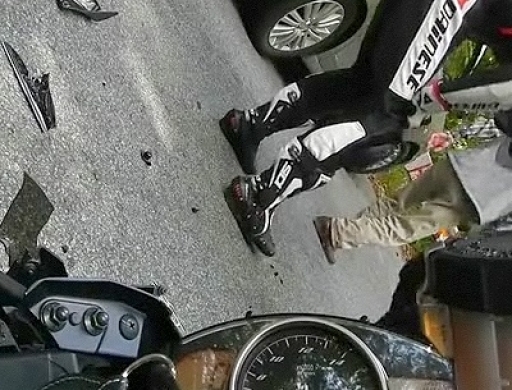 Motorrad Crash. Streetsurfing, Auto gesehen, Schreckbremsung, Yamaha R6 platt..
Yamaha R6 crash.My first crash on my new 08 R6. Under 5000km on the bike. Just got my license and driven the bike about two months. Following my friend on his Kawasaki ZX636 through the mountain roads for about an hour,my vision fixated on him and I was driving on autopilot. Hit the track the day before and was feeling tired and not concentrating. The moment I saw the car it looked like it was turning into me and I panicked. I actually saw the car a split second before it came into view on camera and applied brakes out of reflex but with presence of mind to not mash the brakes, but not enough riding experience to know to just throw the bike down harder to turn sharper. Car turning towards me and coming into view right when the corner got tighter surprised the hell out of me on such a small road and I fixated on the car,and thats exactly where I went. Luckily came out with no broken bones, went home with a spinal sprain,stubbed pinky,bruised knee and shoulder, slight headache and a lesson learned. Gear really saves your life! If I didnt have full gear on I think I would be handicapped or dead. Took the cops an hour to get to the scene all the way up in the mountains so its scary to think about it. Although I still crashed, a big shout out to Dunlop and thier Q2s, you wont notice on video but I was braking before the slip and I was surprised they didnt give out earlier,especially at decent lean in the corner. Stay safe out there on the roads guys!